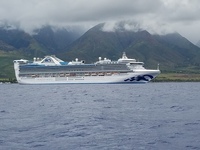 This was a great cruise though I wish there was more time in Hawaii. Days at sea were great though. Excursions were pretty good but the weather was not very warm and we had lots of rain in Maui. Our waiters in dining room and at afternoon tea and the server who brought morning coffee were wonderful. Food was delicious. We had cabin E207 which was above the Princess Theater. Sometimes we could hear music from there but at least it was over before we went to bed. Having a balcony was nice except the weather was quite cool so we didn&apos;t utilize it enough. Not many children on board so that was really nice. The entertainment was not as good as the old days especially the big productions which have really been pared down. But Tiki Dave and Michael Harrison were wonderful and so were others. The ship was always clean and our cabin was too. We were very pleased with our cabin steward. We also enjoyed going to the casino. It would be nice if it was smoke free all the time tho. I wouldn&apos;t really recommend going to Hawaii on a cruise for your first visit. It&apos;s so hard to really get a good reading on the islands especially when it rains. I think it would be better for 2nd trips or later. No problems with embarkation and disembarkation. They were perfect! We did not spend any time in Los Angeles. Been there before. Loved the naturalist&apos;s talks. Mark was so interesting and super nice. Cabin was way up front so we had to walk to the back for dinner every time. I would not like this cabin again if I had dinner in the Amalfi. It was exhausting for my friend who used a walker. Also, the elevator situation on decks and 7 was a mess. We had to wait for up to 10 minutes to get an elevator since only 2 elevators out of 4 went to the dining area. I thought this was a super tour. Our guide was really wonderful. We really enjoyed her. We got lots of extras like cheese and bread and olive oil with our wine samples at both wineries and even pizza and tequila tastes at one of them. My 2nd time on this one and I have enjoyed it both times. We were on a small bus for 6 hours and saw a variety of places. Loved the volcano areas and the orchid shop. Loved the river cruise. Some beautiful music and scenery. Nice personnel there who took good care of us and kept us entertained. Fern grotto was lovely. The canyon trip was wonderful. Beautiful area. Pretty area. Not much to do there though. Nice gift shop. Everyone was nice on the boat. Good experience. We did see a few whales but not everyone was so lucky. But that&apos;s par for the course.